The Baltimore NCSY presents the 37th Annual Isaac H. Taylor Jewish Music Festival. 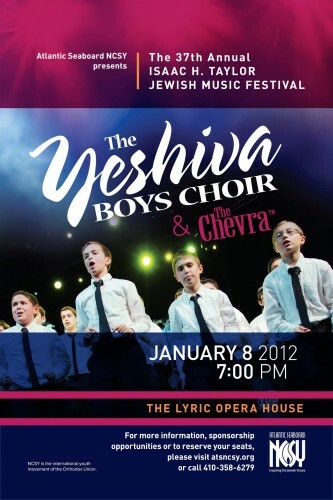 Featuring the Yeshiva Boys Choir and The Chevra. This Sunday, January 8, 2012 at the Lyric Opera House in Baltimore, MD. All proceeds to benefit NCSY. Click hereto buy tickets and see the seating map.